When Katarina from Edgy Polish started contacting me to use some of my pictures on her site, I never knew it would turn out that she would actually want to send me polishes to swatch. I had requested holo polishes and she did not disappoint! She sent me 8 altogether which were 3 brands I had never tried before. Here I have the first 4, and I'm so glad she sent them. 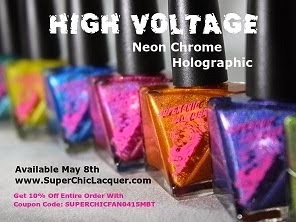 Both Darling Diva and Crows Toes had beautiful formulas and gorgeous holo to boot! Let's start with the Darling Diva polishes first. The holo is amazing in this dark base - and the gold flakies are so pretty! The linear holo of different greens are breathtaking in real life, just too gorgeous. This polish was made for Edgy Polish and is only sold through Edgy Polish's site; it's magnificent! I am so in love with all of these polishes - thank you so much Katarina!